Formative symbolism: Cosmic Resistance. Reconciliation of Tower and Hanged Man. Ultimate end of all energy. Tav forms Lavanah/Moon with the dual qualities of Freedom and Slavery. Tav (400) is the exaltation of the entire cosmic existence in its utmost capacity to resist to life-death. The seventh? But, after all, there are only six? This teaches that here is the Temple of the [celestial] Sanctuary, and it bears all [the other six], and that is why it is the seventh. And what is it? The Thought that has neither end nor limit. Similarly this place, too, has neither end nor limit. Only six outer (Cube) or lower (Tree) directions or sephirot. Where then, is the Temple? Here, in Her natural place, the last card of the tarot Major Arcana and the seventh of seven planetary Tarot, the High Priestess. 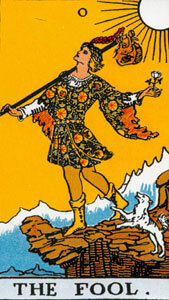 The identity of the last Tarot card, corresponding to and deriving from the last letter of the Hebrew alphabet, is the most important after the Fool, because Tav is Aleph's counterpart, in which we find the Seal of Creation. Everyone, depending on a misguided (we would say encoded) tradition, wants to place the World here, missing the significance of Beth-El as the House of Aleph, the Fool, in the case of the World, and the meaning of the Temple as a reflection of Aleph in the case of the High Priestess. Which card looks more like the feminine sanctuary and tabernacle of the one dual energy to you? Everything that happens, happens because of two intertwined, opposed energies, Aleph and its counterpart Tav. The Heavens and the Earth were created Aleph to Tav in the multi-dimensional structuration of the universe. These two energies establish opposite poles of energy -- infinite expansion and infinite compression -- that support and sustain all of creation. Even Bayt could not be without Tav. The secret of Tav, and why the High Priestess belongs here, lies in the Moon at her feet. Each of seven planetary Hebrew letters are "double" letters: they have two (hard and soft) pronunciations and are each, except for two, assigned to rule two signs in the zodiac, in both "diurnal and noctural" modes. The two are the Sun and the Moon, the sources of physical (solar) and psychic (lunar) energy. These two have their "opposites" combined in the same sign -- Cancer for the Moon and Leo for the Sun. The opposites of Tav/Thav are "freedom" ("government") and "slavery." These two equations, Memshalah and Abadot, describe a burial in Tav (Abadot) and a springing forth from Sheen (Memshelah), of energy. Here, Tav, archetype of cosmic resistance, receives the energy of Aleph and either frees it or binds it in resistant structures. Tav, the Moon and our psyches reside in an interior space, separate from all the other planets, whose impersonal energies pass through the center on the axes of the Cube of Space. Their qualities contribute to structuration. The Moon, whose dual home is Cancer formed by the unstructured energy of Hayt/8, cannot act, but must be acted upon. It can only bind or free energy. 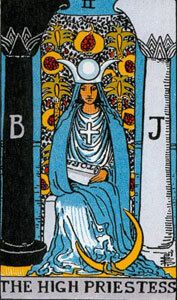 The High Priestess sits, the Moon at her feet, between the two pillars of the energies of night and day, before a veil decorated with pomegranates, symbols of fertility. Behind the veil is the sanctuary of energy and the secret of endogenous, continuous, creation, as the result of the two poles of energy, Jachin and Boaz. Hidden is the equal role of the feminine in manifestation, and the position of the human psyche in the scheme of creation. Tav is the terminus of all the energies that came into being with and "after" Aleph, the Infinite energy in expansion. It is the energetic/structural backstop of Bayt, Dallet, Hhayt, and Tayt, where energy must meet a resistance to create a form from formlessness. It is passive and compressive and feminine to Aleph's active, explosive, masculine energy. And as feminine, it is fertile, engendering the entire universe in response to Aleph's infinite energy. This ongoing co-creation is the secret of the High Priestess, key to the Sanctuary of Tav, last card in the sequence of 22. If we can come to give up fuzzy "archetypes" and "magickal" confabulation and instead read the symbolic and energetic relationships between the structures being described, we can see a coherent, necessary and sarcred whole in the placing of the Moon (Psyche) at the center (not the periphery) of the Cube of energies, where it is formed by Tav (the last, not the third letter), Sanctuary of Aleph with the two opposed but self-contained qualities of burial and liberation of energy (the free/bound energy of psychoanalysis, etc). Is it the cards, or the viewers, that are blinded? The true formative symbolism is right before our eyes. 2/Bayt/Container/World - 3/Ghimel/Motion/Wheel - 4/Dalet/Resistance/Tower - 20/Kaf/Physical-energetic supports for life/Sun - 80/Phay/Unstructured Possibilities/Empress - 200/Raysh/Cosmic Container-Mind/Magician. 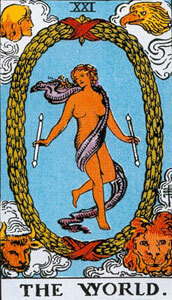 And the Seventh: 400/Tav/Thav/Cosmic Resistance/The High Priestess, the Moon and our own psyches. The vertical symbolism of the column of fours and its theme of resistance is obvious when the Tower and High Priestess are restored to their natural positions. 4-40-400: Archetypal Active Resistance-Existential Passive Resistance-Cosmic Resistance and Resolution of Active and Passive (B&J). This is as clear as the Fool and the World, but no one can see it, for some reason.